It’s the biggest catch-phrase of moving between continents. When Chloe and I first arrived back in San Diego, it was the first question on everyone’s lips—are you experiencing culture shock? Of course, this question was directed the other way, assuming that we had been assimilated into the East African way of doing things, having become foreigners to the American ways that we all take for granted. This chapter is mainly concerned with adjustment within a non-American context. Culture shock, broadly defined, is the disorientation that takes place when entering a different culture and the unease and anxiety that is produced by said disorientation. In its best incarnation, culture shock is also the source of many great missionary anecdotes which can amaze and dazzle supporting churches and fellow missionaries alike. At its worst, it can be a catalyst for sending people home from the mission field sooner than they had hoped. By the grace of God, Chloe and I managed to largely avoid this disorientation. We were helped along by our friends at the Mission who have years of experience working in Uganda. By the end of our year, we had learned to successfully navigate marketplace negotiations, the disparate expectations between us and our employees, and had even waded through the Ugandan bureaucracy long enough to be handed driving permits (this latter makes a couple hours at the DMV a joyful experience). Culture shock, while it can be aggrivating at times, serves a very useful purpose. It reminds all of us that we are sojourners looking for the City of God. Our allegiance is not to family or friends or the country of our citizenship, it is to Christ and His Church. All lifestyle that does not stem from this loyalty is secondary. 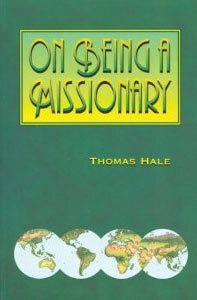 Having said that, Hale suggests that everyone who goes to the mission field, no matter how flexible, will encounter some degree of culture shock. There will always be something difficult to adjust to. This is true. When you live two to six hours away from a grocery store or a source of auto parts, you have to learn to plan and live differently. Recognize it—It’s important to be able to pick up the signs. Culture shock is sneaky and can overcome you quickly, like a python in the grass. Before you know it, culture shock has stopped you from breathing and is in the initial stages of digesting your lifeless body (my words, not Hale’s). Adapt as much as possible—For better or worse, we live in Uganda and need to get used to this fact. Chloe and I have tried very hard to live with the implications. We expect everything to take longer. We expect people to move more slowly. We’ve made a conscious effort to live as much as possible with the things that can be found in Uganda (and how much improvement there is to be made, here). We are constantly reminded, and learning to accept, that we are not in control of our lives and surroundings, but it takes great effort to understand the freedom that comes with surrendering these things to the goodness of our God. Create a circle of friends—Being open with our neighbors about our lives and showing interest in theirs has been essential to our time in Karamoja. Making a conscious effort to bond with people has increased our sense of friendship and belonging and has allowed us to receive and give advice on many difficult topics. Put yourself in a national’s shoes—This has been a very helpful idea for Chloe and I. Being white in East Africa often presents us with tremendous advantage, but also distances us from the lives of our African neighbors. When things aren’t going smoothly, it’s helpful to get a bit of perspective by considering the lives of our local friends. By seeing how they react to simple things like bad weather or sickness, it helps us first to see the relative ease with which we live as well as appropriate reactions and solutions to various situations. When I’m biking home and it begins pouring rain, I might bemoan the discomfort of riding in the rain, or I can observe and adopt the Ugandan practice of waiting the storm out under a tree. It seems like a simple solution, but it belies San Diegan common sense. Maintain an attitude of exploration and adventure—This advice is invaluable. It goes a long way to help our attitude if we treat a trip to the market as the potential source of a good story of interesting find rather than a chore that takes more time and effort than it would in America. You never know when you’re going to find Irish potatoes in Namalu. Or a Bathing Ape shirt. So live it up! Maintain close links with fellow missionaries—We’ve been tremendously blessed with good missionary friends in Karamoja. In addition to our own mission members, we have friendships with other groups operating (relatively) close by. Others driving to further places will often stop by our compound on their ways. We were invited to visit some veterinarian friends for Thanksgiving. We can get dinner and a board game or a place to stay with friends when we go to Mbale. Don’t take yourself too seriously—We walk a fine line between trying to appear savvy and throwing up our hands at the absurdity of our lives sometimes. Fortunately, our Karimojong friends are always more than happy to hear and get a laugh from a story of our foibles. The refusal/inability to take myself too seriously is a catalyst for practicing the local language and custom. My story of getting lost in a corn field and trying to solicit the help of a woman weeding who fled my approach, thinking I was an enemy or a ghost was a source of tremendous amusement for our compound staff. Learn the language—This is an area in which we need much prayer. Chloe has been very motivated toward learning and has shown great alacrity. I have often found it more expedient to use English, but learning Karimojong will pay dividends in the long term for which I will surely be thankful. But the future is so far away. Getting off of the plane in Entebbe in the early tropical morning for the first time brought me a strange sense of familiarity and adventure. The initial shock of these new things was exhilarating, but our ministry there has grown in proportion to our ability to get past this cultural disorientation, and we pray that it might continue in this way. One day, I’ll wear a necktie so that you know I am enjoying my work.